CareCulture Health Partners offers low volume hospitals a unique hybrid ED and hospitalist program that integrates emergency medicine and hospital medicine into a combined patient care service. Through our hybrid program, inpatient services are provided as an extension of traditional emergency medicine services by physicians skilled in both emergency and inpatient care. This option provides an inpatient program without the cost of a traditional hospitalist program. Reap the benefits of two robust programs, without the cost of two robust programs. Our unique hybrid ED and hospitalist program that integrates both practices into a combined patient care service. Through our hybrid program, inpatient services are provided as an extension of traditional emergency medicine services by physicians skilled in both emergency and inpatient care. This option provides an inpatient program without the cost of a full hospitalist program. Many studies have shown that there is a direct correlation between clinical outcomes and variability in the delivery of care. One of the benefits of our hybrid program is that the same physician is caring for the patient in both clinical settings. In addition, we implement standardized clinical pathways and order sets that our clinicians follow. The local medical director at your facility provides extensive clinical oversight. We also assign a regional medical director to your hospital to provide mentorship to the medical director and provide quality oversight at your hospital. We have found that the key for effective leadership is not overburdening the medical director and the regional medical director. We place a restriction on the number of clinical hours that they can work each month and require a set number of in-hospital administrative hours. CareCulture’s hybrid program is designed to increase efficiency, reduce cost, and improve the continuity of care, which ultimately benefits the patient experience. We accomplish this by recruiting physicians with extensive experience in both emergency medicine and inpatient medicine. This physician cares for the same patient throughout their hospital visit. We analyze ED patient arrival patterns, and inpatient average daily census patterns to design a hybrid staffing model that covers your facility’s unique needs. Typically, the hybrid physician handles rounding from 7am to 11am before the ED volumes peak for the day. Depending on the needs of your facility, an advanced practice provider may be added to the staffing model to provide support and float between the two services. Our Hybrid Program is ideal for hospitals with ED volumes less than 12,000 annual visits (an average of 30 patients per day). We have found this volume allows enough time for our physician to safely accomplish the tasks associated with caring for patients in both clinical environments. Why IS HYBRID BEST FOR RURAL HOSPITALS? Managing acute, episodic, and unscheduled care is a challenge for all hospitals, but it is especially challenging for rural hospitals. Navigating the rising costs of healthcare delivery, decreasing reimbursements, and recruiting and retaining high-quality clinicians is a major undertaking. Emergency and hospital medicine programs are integral to navigating these issues. Healthcare systems have several options to handle the management of their emergency and hospital medicine programs. 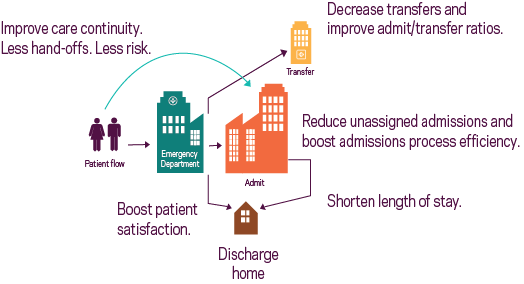 Typically found in busier hospitals, this model requires patient volume to support two separate programs. When management of the programs is split between different organizations, it often becomes difficult to align performance and patient experience between the two programs. The cost to run two separate programs is typically cost prohibitive for smaller community hospitals. This model is common in rural and critical access hospitals. The emergency department is staffed by a contract group or employed by the hospital. Inpatient care is provided by community physicians who are assigned to be on call as part of their admitting privileges requirement. This model works until community physicians opt out of taking call to see more patients in their practice or seek a different lifestyle. The admitting physician’s primary commitment is to his/her clinic patients, therefore rounding typically occurs before clinic hours, during their lunch break or after the clinic closes. This results in delays in responsiveness to inpatient codes, patient status changes, order clarification and/or changes, and consultations, which increases patient’s length of stay. This is the least desirable model. Using temporary physicians can have a deleterious effect on teamwork, as more transient workers are less invested in the local community and your organization’s mission, vision, and long-term goals. CareCulture Health Partners offers rural and critical access hospitals a unique hybrid ED and hospitalist program that integrates emergency medicine and hospital medicine into a combined patient care service. Through our hybrid program, inpatient services are provided as an extension of traditional emergency medicine services by physicians skilled in both emergency and inpatient care. This option provides an inpatient program without the cost of a traditional hospitalist program.